A group of Hawaii Kai residents is asking the Hawaii Kai Marina Community Association to reconsider plans to put dredge material on a manmade island now populated by endangered Hawaiian stilts. Comments will be accepted until April 15. » Nesting sites: Often adjacent to or on low islands within bodies of fresh, brackish or salt water. » Food: Feeds in shallow water on worms, crabs and fish. » Numbers: About 1,200 to 1,600 live on all the major islands except Kahoolawe. About 70 percent are found on Maui and Oahu. The marina is seeking a U.S. Army Corps of Engineers 10-year permit to put gravel, sand and mud taken from the bottom of the marina during maintenance dredging onto two artificial islands that it owns, known as Rim Islands 1 and 2. But since the last maintenance dredging of the marina in 1995-1996, Rim Island 2 has developed into a wetland habitat that has attracted thousands of birds, including the endangered Hawaiian stilt. "The birds have come in. It's a beautiful area. It's a natural area," Chuck Johnston, a 30-year resident of Hawaii Kai, said of the 4-acre island with a saltwater pond in it that he can see from his yard. "Just last week, I was out on the dock and three Hawaiian stilts went by, two adults and a fledgling (teenager)," Johnston said. "And there are 3,000 to 4,000 birds out there, not just the Hawaiian stilts. Finches, egrets, mynah, doves, any kind of bird you can imagine has found that island." 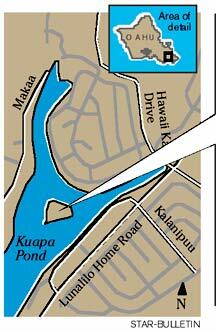 Before the marina was created, Kuapa Pond was the largest stilt colony on Oahu, Johnston said. "I think they're making a comeback. If the Hawaiian stilts don't belong in Hawaii Kai, I don't know who does." Hawaiian stilts, or ae'o, are distinctive black-and-white birds, about 16-inches long, with hot-pink legs. They forage for food in water that's just a few inches deep. There are an estimated 1,200 to 1,600 Hawaiian stilts in the state, mostly on Oahu and Maui. They have been protected by the Endangered Species Act since 1970. Another Hawaii Kai resident, Jim Dittmar, has documented stilts nesting on Rim Island 2, which is near Mariner's Cove at the makai end of the marina. He has concerns that the marina is trying to avoid its responsibility to protect the stilts. Johnston said he hopes the marina association will decide to place dredge material on a two-acre parcel it owns further up the valley instead of dumping on Rim Island 2. There, it could dry out the dredge material and have it hauled away -- perhaps even to be sold to a nearby cemetery. But Hawaii Kai Marina Community Association President Jaap Suyderhoud says there is no conflict between using Rim Island 2 and protecting the stilts. 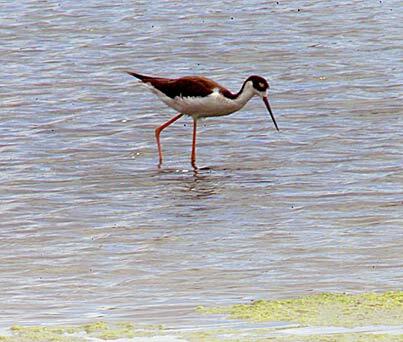 "After we dredged in 1995-96, we have proven that we were capable of creating a Hawaiian stilt-friendly habitat," Suyderhoud said. The association proposes putting dredge material into the deeper water end of the island first, then onto the dryland side of the island, to avoid the inches-deep waters stilts prefer. And it promises in its permit application to not put any dredge material on the island if there are nesting birds. That could work, if monitored properly, said David Smith, Oahu wildlife manager for the state Division of Forestry and Wildlife. "If you did it right, they could actually probably make more and better habitat than there is now," Smith said, by filling in deeper areas and making more shallow-water habitat for them. The marina is seeking the permit now because it may need to dredge the mouth of the marina in as little as a year, Suyderhoud said. But dredging that would affect Rim Island 2 and the stilts probably wouldn't be done until 2014 or 2015. Rim Island 2 has room for an estimated 45,000 cubic yards of additional dredge material, Suyderhoud said. But most material dredged at the marina mouth would be sand that could be placed on Portlock Beach, he said. "We will accommodate the birds. Our best management plan shows that," Suyderhoud said. "Anybody who's concerned about it is incorrect. We've addressed it." Alternative methods for disposing of the dredge material -- including ocean disposal and drying and hauling -- are more expensive, Suyderhoud said. However, the U.S. Fish and Wildlife Service has asked the marina to analyze its options to using Rim Island 2. The service by law consults with the Corps of Engineers on permits affecting endangered species. "We believe there are ways they can meet their dredging needs and at the same time retain the area's habitat value for endangered water birds," Fish and Wildlife spokesman Ken Foote said. The corps is reviewing comments it has received on the permit, including those from Fish and Wildlife and about 40 letters from Hawaii Kai residents and others that asked for a public hearing. "They're primarily concerned about the welfare of birds on Rim Island 2," said the corps' Farley Watanabe. "There's a perception if they dredge it's going to eliminate the bird (population) and habitat." The state Department of Health's Clean Water Branch and Department of Business, Economic Development and Tourism's Coastal Zone Management Division also must approve any permit and could potentially hold hearings. Some Hawaii Kai residents object to Hawaii Kai Marina Association plans to use Rim Island 2, foreground above, to dump dredged material over the next 10 years. 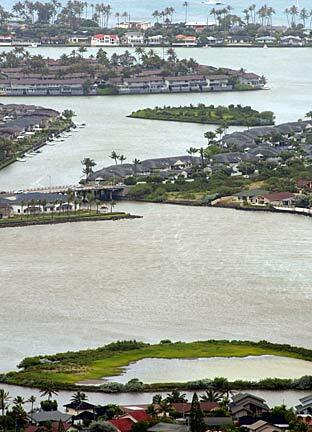 State and federal agencies are reviewing the marina's application for a dredging permit. » Space available: About 45,000 cubic yards of additional dredge material can be added. » Area: About one-third is covered by water, ranging from a few inches to as much as 12 feet deep. » Birds: Besides a nesting area for the Hawaiian stilt since 2002, the island is home to the Hawaiian coot, the common moorhen and the koloa.